Chocolate Organza bags are a wonderful alternative to a traditional gift box or merchandise bag. 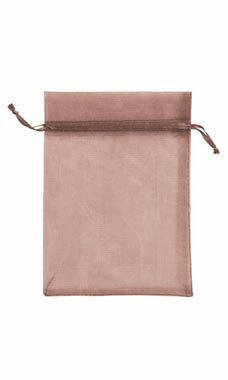 Our 5x7” bag features a soft see-through fabric that has a beautiful sheen that is silky to the touch. The bag has an integrated satin drawstring that can be pulled to secure the contents inside. These are wonderful for all sorts of merchandise such as jewelry, candles or small gifts. Each bag is sold in packages of 10 each.